I recently had the opportunity to travel through 5 or so roundabouts on a recent bicycle ride. Four of those occurred over a small stretch of MD-216 located near US-29 in Howard County. Although I'm a fairly confident road cyclist, I found these roundabouts difficult to navigate safely. Due to the multilane nature, it became nearly impossible to control vehicles from passing me in the left lane, and then cutting me off as they went essentially straight through, while I was in the right lane making a 270 degree turn. Additionally, vehicles entering the roundabout as I was passing their entrance never stopped (nor yielded the right-of-way) and almost took out a fellow cyclist behind me. There must be a better way to design multilane roundabouts so that vehicles and bicycles can be accommodated safely. The Maryland SHA has stated on it's own website that these multi-lane roundabouts are inherently more dangerous than standard single lane roundabouts unless proper facilities have been provided. "For multilane roundabouts, bicycle safety at roundabouts has been found to be poorer than at other intersections unless separate bicycle or multi–use paths are provided around the outside of the roundabout." This map above shows the location of the four multilane roundabouts discussed. 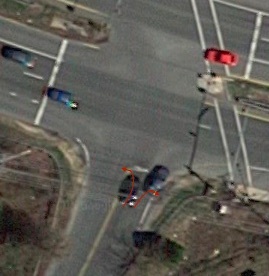 Worse yet, after exiting Circle 3, I encountered one of the most dangerous exits/merge areas for a bicyclist. Cars and bikes are forced to share a single curbed lane that narrows. Cars are traveling at or above the speed limit by this point. From the right, traffic has exited US-29 and is merging onto MD-216 and these vehicles are traveling at speed when the two lanes meet, leaving bikes stranded between two lanes of fast traffic separated by a dashed white line. If there is a line of cars exiting from US-29, bikes cannot quickly merge to the right shoulder and must remain in the middle of the left lane. Again, remember, vehicles in the left lane are traveling at speed and don't understand why bicycles would be out in their lane. Perhaps a better option would be to create a bike large bike lane that cuts through the medium early giving bicycles a safe place to stop and eventually enter this section of road via the right merge lane. The Maryland SHA needs to re-examine these particular roundabouts, and it would be prudent to identify a better standard for multilane roundabouts where bicycles can safely navigate. I believe that roundabouts do make cycling safer, and following the design principles in the following document should allow all users to remain safe.